Recording yourself is very intimidating! But don’t worry – I’m here to help in this simple, easy to understand article! We will cover all the essential tools and hardware to record yourself to create a song. Hardware such as microphones, headphones, pop filters, and even acoustic isolation microphone absorbers. 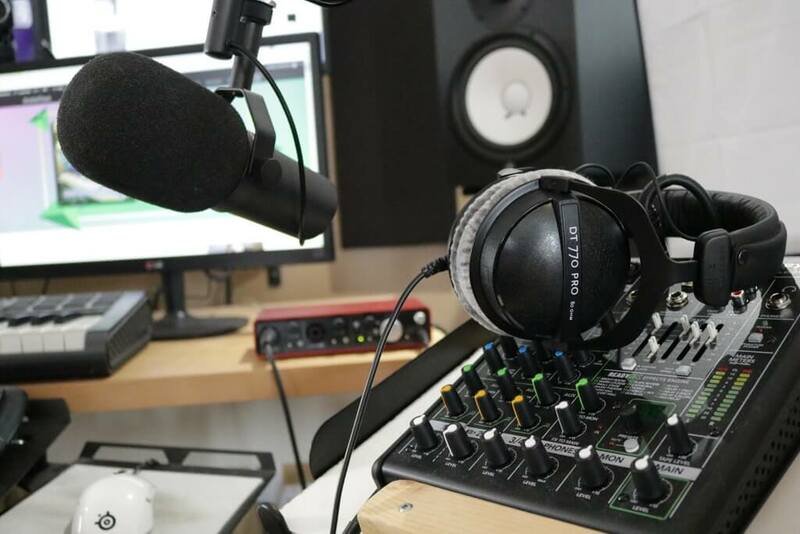 Whether you are recording yourself, or an artist coming to your home studio, this recording guide should help you on your way! Since this website is all about beatmaking and computer music production, I will be covering that aspect of recording. The music programs producers use to make music are called DAWs. A DAW stands for digital audio workstation, and it’s absolutely amazing what this piece of software can do. You can record vocals and instruments directly into the program through an audio interface, create drum loops with high quality sounds, arrange that track, mix and master the song, and finally, export the music into an audio file so you can share with the world! Your music program is your main hub – it’s the most essential tool! An audio interface was confusing for me at first! An audio interface is an external sound card which plugs into your computer with a USB cable (there are other connections available like thunderbolt and firewire). Audio interfaces allow you to connect high quality microphones with XLR cables into your computer, while providing a volume knob to control the microphone’s gain for the ultimate recording level. You can also plug in your speakers, instruments, or other musical devices like turntables, samplers, and similar music creating items! 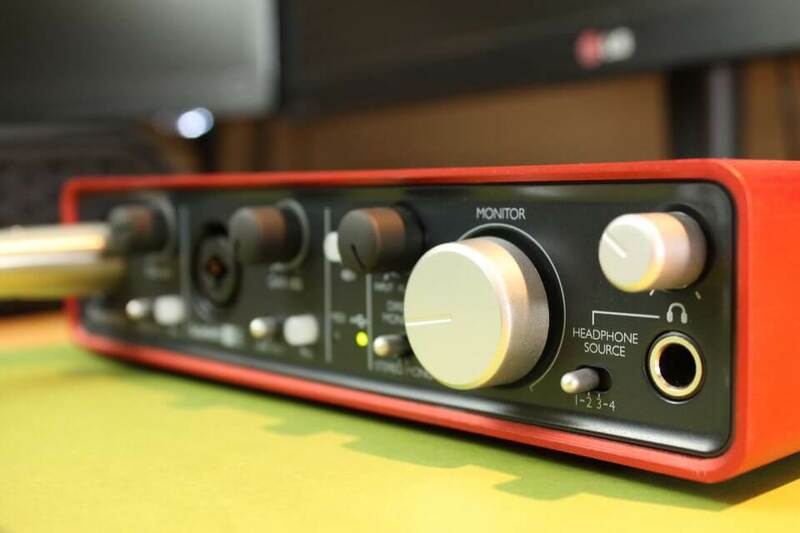 It’s important to know the lingo when buying an audio interface – it can be confusing – they are sold in a variety of sizes and configurations. This means the audio interface has two inputs and two outputs. In simple terms, you can connect two devices – let’s say two microphones, or a microphone and a guitar with a TS cable! If you were to record drums, you would probably be setting up quite a few microphones, so you’d need more inputs to allow for this! In general, you really don’t! But if you ever get into using external hardware such as a single channel preamp for your microphone, or a hardware compressor, you can send audio through different paths to be creative. Let’s say our audio interface is a 4×4 – That’s 4 inputs and 4 outputs. An audio interface would have these 4 outputs grouped into 2 groups. That’d be outputs 1-2 and outputs 3-4. Let’s say you’re recording an artist. You’re main studio reference monitor speakers are usually set on outputs 1-2. But if you’re recording artist wants a different sounding mix, you can send to his headphones to outputs 3-4, and adjust a mix to their liking. So what audio interface do I recommend to you? You want a quality named brand, with awesome pre-amps. Honestly, yes there is a difference between brands, even though the price may be the exact same for the exact same specs in terms of inputs and outputs. Microphones are an overwhelming subject. There are different types of microphones, such as dynamic, condenser, and ribbon..
Also, there’s different pick up patterns as well! I’ve compiled a list of my personal microphones I use for recording. We’ll first discuss pick up patterns. A pick up pattern is just how the actual microphone records the audio it hears. Imagine your ear is a microphone and a song is playing. If you place your hand over your ear, the song will sound muffled. That’s the idea behind pick-up patterns. You can also use these pick-up patterns for a creative edge, too! But for your starter microphone, I personally recommend a cardioid pick-up pattern. The cardioid pick-up pattern actually resembles a heart – hence the name! It is very popular for vocals/speech and reduces recording sound from the sides and rear of the mic. This helps to get a clean and dry recording, which is your desired end result in most cases! The figure 8 pick-up pattern is known for duet singing, as singers can sing from the front and back of the microphone. It’s also used for an advanced stereo trick called Mid/Side ! The figure 8 pick-up pattern is also called bi-directional, too. Dynamic microphones require a stronger pre-amp to get a good volume to record. If you’re audio interface’s pre-amps are poor, the louder you push them the more background hiss and noise they introduce! That’s why I suggested a quality audio interface to get you going. Dynamic microphones tend to be not as bright, but in my personal opinion, I love dynamic microphones for my own voice. That’s what makes microphones such a hard topic to talk about – a mic may sound great on my voice, but maybe not on your voice? 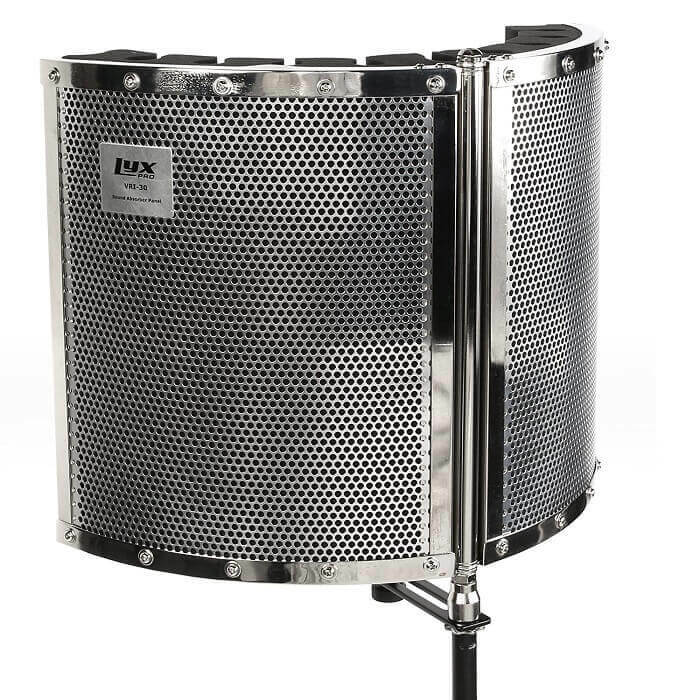 Condenser microphones capture higher frequencies, and are exceptionally great for instruments. Don’t get me wrong, they also sound amazing on vocals, too! You can get started recording high quality vocals for just around $100! Ribbon microphones are a super unique concept for microphones. There is actually a metal ribbon, which is quite fragile, and is used to capture our audio which we record! I personally have no experience with ribbon microphone yet, but here’s some ribbon microphones on Amazon to check out! A microphone pop filter (or windscreen) is a very important asset when recording vocals. 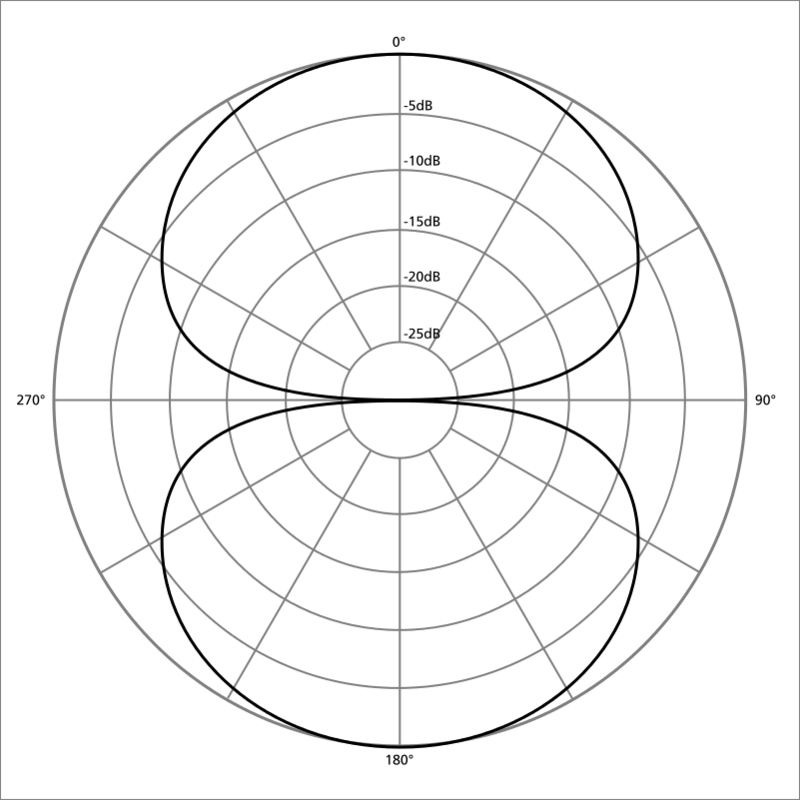 It’s that round circle thing that sits in front of a microphone. The whole point of a pop filter is to protect your recording from plosives. Certain words we as humans say produce extra wind than others. Think of of the word poppy – put your hand in front of your mouth and say it! Even is a pop filter, these plosives can actually still slip through into the recording. But here’s a trick! With an EQ, you can use a low cut filter and remove some of the low-end to prevent the wind sound in your recording. (This can also be useful for other noises like back ground fans, air conditioners, or even computer fan noise!). But if your plosive has made your recording to actually distort, there’s usually no going back. 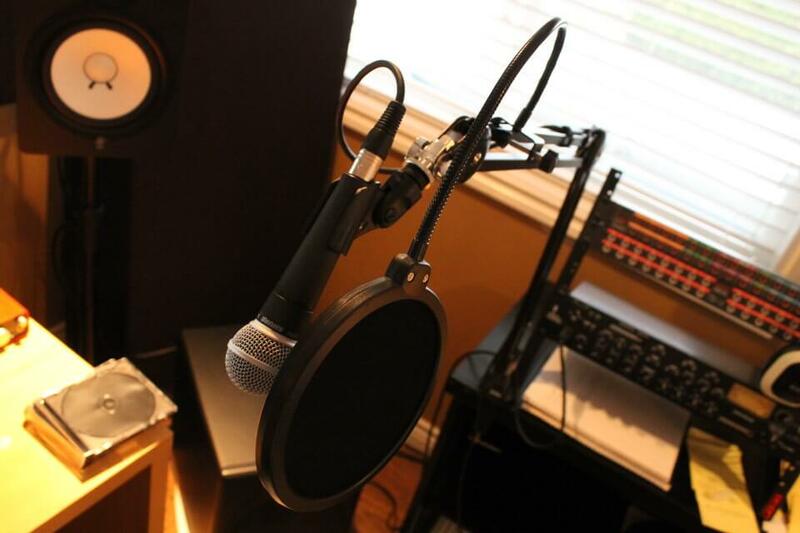 A pop filter is a thin material placed in front of a microphone to prevent wind from distorting your audio recording. Typically they are round with a nylon fabric, but you will also see metal versions of pop filters! 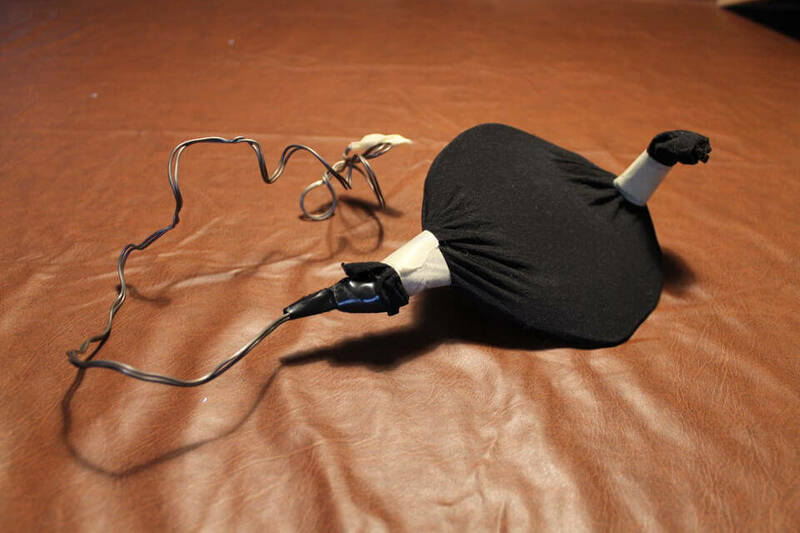 They tend to have a goose neck which clamps onto your mic stand, and is bendable so you can set it in place. But once you get them to sit where you want, they work great! People say pop filters can dampen the high-end of your recording a bit. I personally haven’t tested this out, but something to keep in mind! For the price of these pop filters, I’d definitely recommend one, and would not suggest you record your vocals without one! A microphone isolation shield is a cool idea. When you speak in your room, sound echos back at you. Yep, that sound will also be recorded into your microphone. But that sound which echos off your wall is delayed by a few milliseconds, but still recorded with your original voice. This makes for a really poor quality recording because you hear an echo, or even a hollow comb filter sound to your recordings. This is where these microphone isolation shields come into play because they absorb the direct sound. These isolation absorbents are not a quick fix to poor recordings, but it will definitely help control reflections. No tool can replace mic placement. It’s so easy to go ahead and buy all these accessories, but without proper mic technique/placement, it’s going to be hard to achieve the quality you’re looking for. I have tested a few microphone cables, but by no means to a case study. I personally haven’t found a difference from an average XLR cable to a higher quality cable. 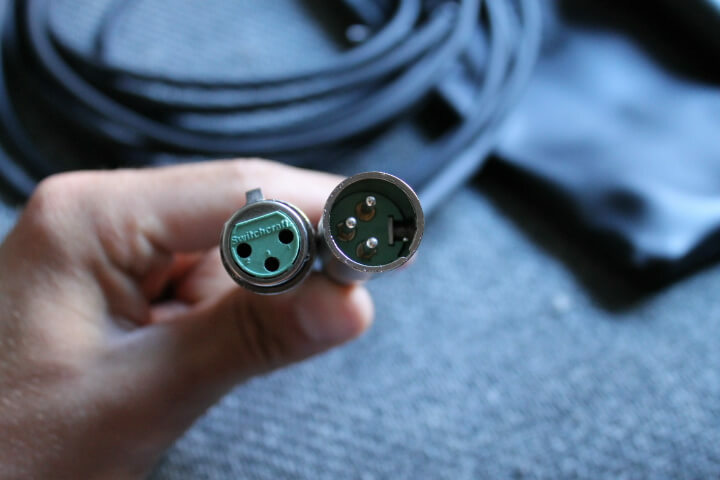 I’m personally using this Lyxpro XLR cable – it’s been great! I’d also like to mention to you about cable length. Obviously you don’t want a 200 foot cable. But you don’t want to be too short either! What if you want to practice some sound design, or record some sounds around your studio and your cable is too short? A longer cable will only give you ease of mind and enjoyment! Above I listed the actual gear you need to record yourself. DAW – This is your music program where you actually record yourself. You can also process your recordings afterwards for that polished sound. Audio Interface – This is where you plug in your microphone. You can control the volume of your microphone signal, as well as plug in reference monitor speakers. Microphone – Obviously you’re going to need a microphone to record yourself! It’s your choice on what type of microphone you’d like to buy. See my favorite microphones to date. XLR Cable – You will need a male to female XLR cable. Female plugs into the microphone, and male plugs into the audio interface. Just think about cable length – the longer the more convenient. Pop filter – A pop filter is essential to prevent distortion in your recordings when your vocalist is extra loud on their plosives. It also just looks cool and makes your studio look more professional! Acoustic Microphone Isolation Shield (Optional) – This is a tool that is known to achieve a dryer sound to your recordings, removing a bit of your environment. This is important because you want to have a high quality dry recording, which you can apply your own effects at your own leisure. Latency is a killer to recording vocals! Latency is the time it takes for your recording to go into your audio interface, into your computer, into your music program, then back out of your music program, into the audio interface, then out for you to hear on your headphones/speakers. In other words, when recording, your audio goes into your computer, processes it, then sends it back for you to hear. This processing takes time, and the result is a delay! When you speak into the mic, it could be delayed by 10-20ms for an example. You may think – that’s not too big of a delay? But when you try to record, it hinders your performance because you’re hearing words echo back at you. Latency really throws you off. 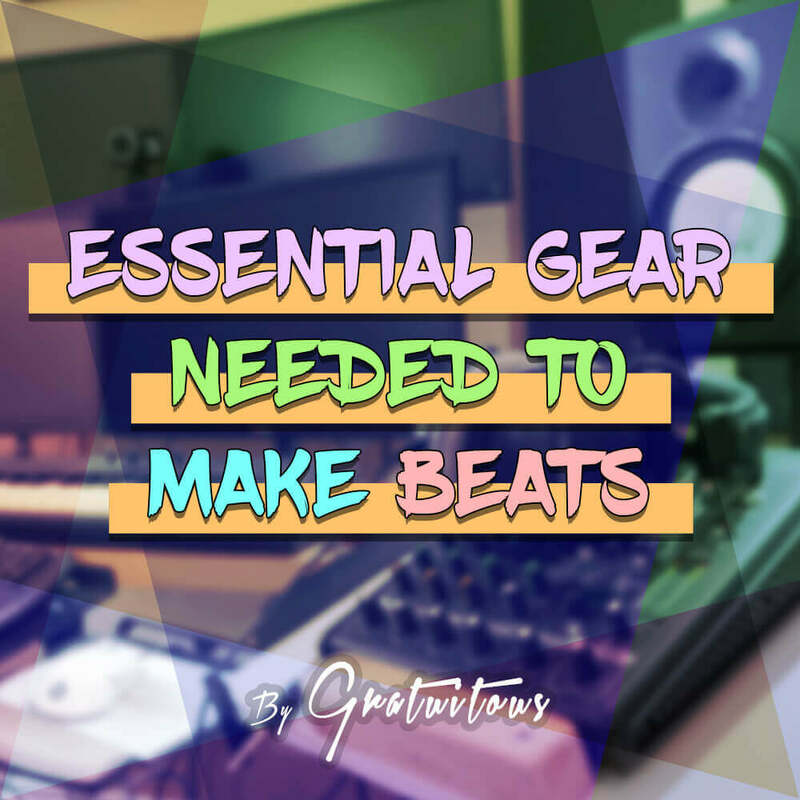 Let’s go over how to actually use these tools to produce the highest quality recordings. Most producers always want the fancy things. They want the most expensive microphones, plugins, and other gear. 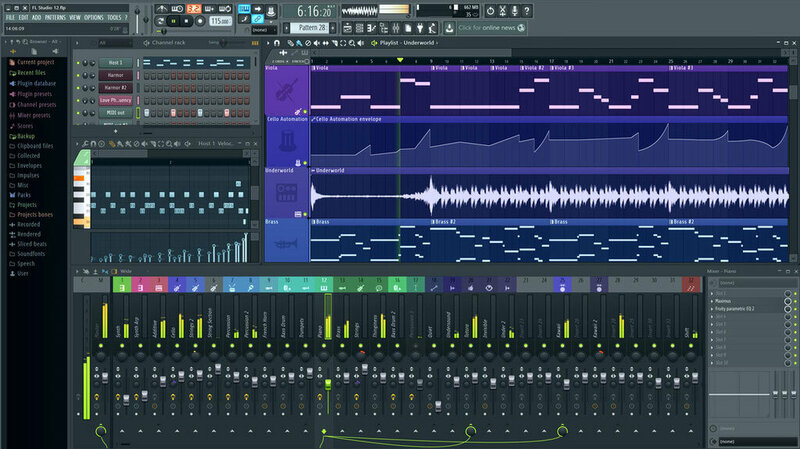 How well do you know your DAW? Your DAW is your most fundamental tool to you. If you don’t know your way around it, you’re pretty much helpless! So with that said, besides needing a DAW to record, you actually need to know how to use it. Yes it’s a learning curve, but eventually you’ll catch on and get the hang of things! The first step to get the most out of your audio interface is to simply install the drivers. You can find these on your manufacturers website. They will either be in a downloads tab or a support tab. If all else fails, you can Google “[Audio Interface] driver”. Once drivers are installed, you can get the maximum potential out of your interface! Inside your DAW, you will want to make sure you select your audio interface as the sound card. Make sure to select the ASIO version though! This allows for the lowest latency, and smoothest playback. Now it’s time to plug in your microphone with the microphone cable. 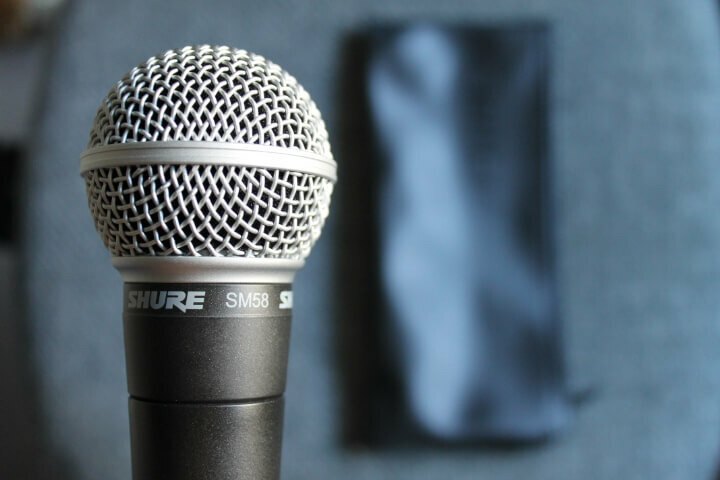 Depending on the microphone you have, whether it’s a dynamic or condenser microphone, you may have to turn on phantom power. Now all DAWs are different in how they operate – so when it comes to recording, you may have to Google how to record in your daw. For FL Studio, it’s pretty simple! On a mixer track, you have an input and an output section. 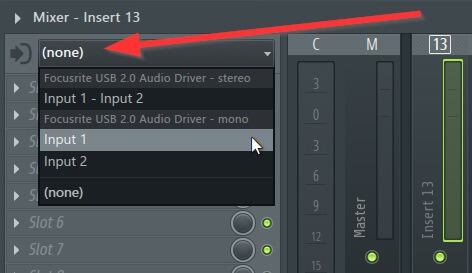 In the input section, you can select input 1 (if you’ve plugged your microphone into input 1 on your audio interface). That tends to be the basics of getting the most out of your audio interface. In terms of how loud you should record your vocal, the louder the better, but make sure your loudest words do not cause distortion. Most audio interfaces will let you know this by having a clip meter. The Focusrite Scarlett series are great because they have a halo light indicator. Green means good, red means clipping! The distance you stand from the microphone can actually be used as a creative effect. But like all creative effects, they are very easy to over do. If you stand too close, it pretty much sounds like you’re eating the microphone. Stand too far back and it sounds like a big reverb chamber with an added computer fan in the background. With that said, people tend to put their thumb and pinky out, and keep that distance from the microphone. If you find your voice is too sibilant, you can rotated the microphone 90 degrees so you’re speaking past the microphone. You can also position the microphone on an up or down angle to help prevent these sibilant words, too. A cool trick with adlibs (these are those background words you hear in rap songs like “ye, uh, you know it, etc.”), you can stand back from the mic extra far. This will capture the voice different, making it easier to mix in! I don’t let the pop filter hit the microphone. I keep the windscreen about an inch back from the mic, while still standing about 6 inches from the mic when recording. It’s pretty self explanatory to use. You don’t even need to buy one. When I first started, I actually put together a DIY pop filter because I’m cheap like that, haha! Over the years though, I decided a pop filter isn’t that expensive, and if people come over, it makes your studio look way more professional. I know life isn’t about looks, but sometimes it is! Regardless your choice, I highly suggest using a pop filter when recording vocals. 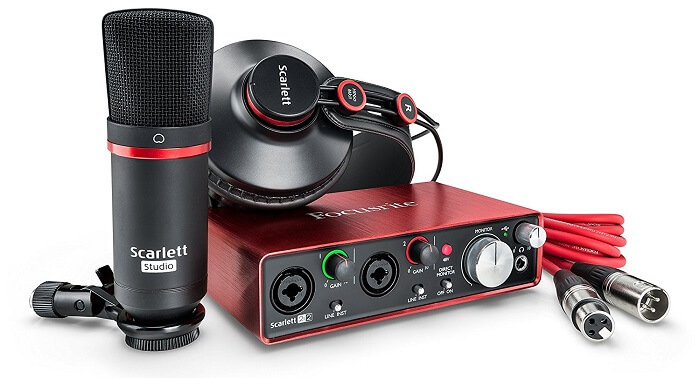 Okay, so let’s take the Focusrite Scarlett 2i4 as an example. On the front of the interface, you can see there are two inputs – either for a microphone or instrument. Let’s say we are recording a single artist. If we use one microphone, we are recording them in mono. There’s no getting around that! Now, if we use two microphones to record their voice, we are recording two separate mono sources! Stereo is the difference between the left audio and right audio channels of a recording. So when we record with only a single microphone, the exact same audio is played through both speakers. But when we record a vocalist with two microphones, these are both actually capturing a mono signal. So if you play them back together, you are still in mono, but just layering your audio recordings for a fuller sound. You must pan one signal to the left and the other to the right to achieve that wide stereo sound. Since the two recordings are different, and panned on separate speakers, this creates stereo for us. If you want to take your vocals to the next level, I would suggest a higher quality mic preamp. I’m currently using an ART Voice Channel. But I have heard the Golden Age Project Preamps are quite good, too! So how this works is you connect your microphone to the high quality preamp. The output of this high quality preamp goes into one of the audio interfaces input. You can leave the audio interface at 0 volume so you use very little of its preamp. Now you can just adjust your higher quality microphone preamp accordingly! A walk-through guide of the essential tools needed to record high quality vocals. If you have any questions about the gear, I’d be happy to assist you if you leave your question in the comments below!